Are you missing out on 10,042,040 job postings? Could it be possible you are not aware of more than ten million job openings? I think it is possible and I strongly believe that’s the case for most of you reading this. I ran a search without any keywords, just under the networking category and there are 251,051 groups that showed up. Each group has a jobs tab where recruiters are able to post openings at no cost. These jobs are now listed under the category “career discussions”, within the jobs tab. I went into a few of the groups and noticed there are at least 2 pages of jobs. Each page has about 20 postings listed totaling 40 positions. Multiply the 40 and 251,051 and that gives a total of 10,042,040 job postings. For those of you who are not active in LinkedIn groups or maybe not in any groups, I advise you to start using the groups as part of your daily job search research. The groups are targeted for specific skill or location. It’s a great way to see what companies are hiring and to check out the career section for other possible opportunities. Set a goal of joining one group a day that is relevant to your skill set and geographic location. 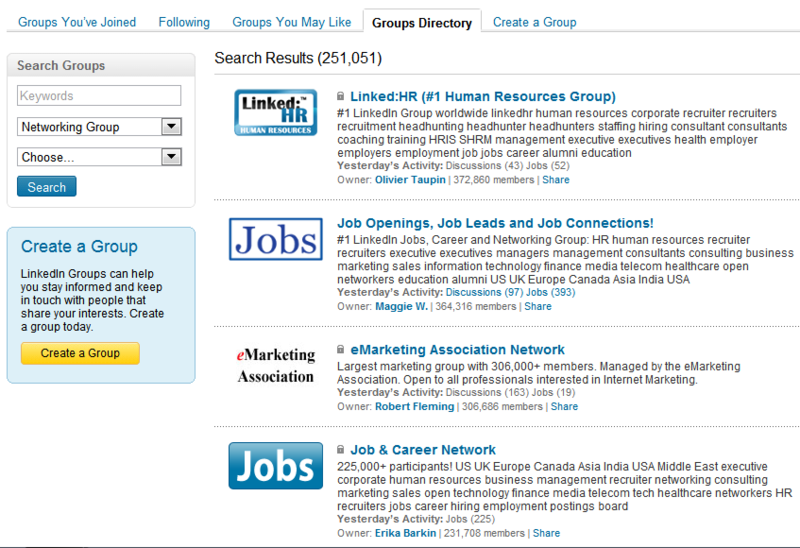 Also search for specific job seeker groups such as Job-Hunt Help and Looking for a job? Previous Previous post: Do you stand out or is your luggage black too?